Issue 4 OUT NOW - £4.50! 140 Pages of pure horror heaven! 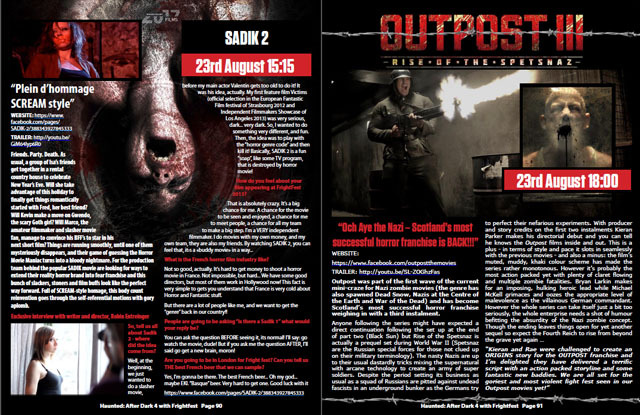 Haunted: After Dark is over the horror moon to be bringing you THE ultimate Film4 Frightfest preview, featuring a look at ALL the 51 films that are to be shown, some exclusive interviews with cast & crew, some exclusive images, some reviews, some spoilers, some twists and turns as we take you on a horror-fest of a journey, this ain’t the best of what’s on at Film4 Frightfest, this preview is about EVERY film that is on – sit back – grab a big tub of popcorn, or nachos (with extra jalapenos if you dare) and enjoy!! 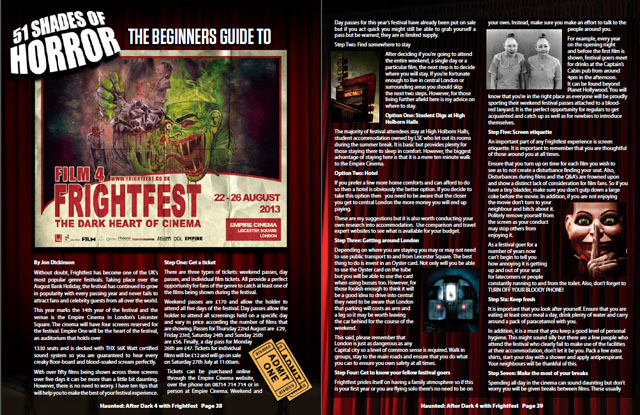 Featuring exclusive interviews with the goddess of Horror, Emily Booth, the Quizmaster from Hell, Andy Nyman and one of THE organisers of F4FF, Greg Day! Film4 FrightFest 2013, returning for its 4teenth year and it has unveiled its biggest line-up in history. From Thurs 22 August to Monday 26 August, the UK’s leading event for genre fans will be at the Empire Cinema in London’s Leicester Square to present 51 films on three screens. Empire 1 will house the main event while the Discovery strands will play in Empires 2 & 4. The new FrightFest Xtra strand, also in Screen 2, will allow fans to catch up with sold-out performances of the most popular attractions.